Hello out there, I have been hunting a used jointer for quite sometime, I recently found a 6” Rockwell Delta Jointer on Craigslist. I was not able to locate a model number but have a few pictures of the unit. It definitely needs some love. It seems to be complete and it does run. I have searched the forums and haven’t been able to find this specific model or much info on it. The pictures aren’t great because it has been stored in a storage container for the past 4 years. It has a WEG Motor on it (see pictures). This would be my first jointer, and the gentlemen selling it is asking $100 for it. It seemed like it could be a decent buy. Any thoughts, suggestions would be much appreciated. Hopefully I got the pictures linked properly. You can find all of the information about your jointer here. Use your serial no. I have this jointer. Bought it new in mid 1970s. Damn good jointer! Thank you Planeman, do you think $100 is a decent deal considering the condition? As you say it runs, I would say $100 is a good buy. Just clean it up and paint it if you chose. Not much to go wrong if there are no broken castings. The trick will be properly installing new blades if needed. Provided the old blades were properly set and are all the same height and are parallel to each other, DON’T MESS WITH THE HEIGHT ADJUSTMENTS! New blades will be precision ground to the exact same dimensions to each other and can be dropped in and tightened up without any trouble. However, if the old blades are installed at varying heights and are not parallel to each other, then you will need to mess with the height adjustments when installing new blades. This can be a challenge. You will need a suitable jig or a dial test indicator to get them right. Just visit YouTube and search for “installing jointer blades” for a how-to video. Also, the adjustment of the infeed and outfeed tables may be too tight or too loose. There are small adjustment screws on the side of the tables that can be tightened or loosened. If the jointer hasn’t been used in a while, these tables may be hard to move from lack of use. Just loosen the adjustment screws and move the tables up and down to free them, then re-tighten the screws so the tables move freely but are fairly tight. You might want to check the parallelism of the two tables to each other by laying a straightedge across both tables to check. The bearings should be good, but if not, you should be able to get replacement bearing easily from a bearings and drives supplier. Ball bearings are standard off-the shelf items. Not an original motor, but does appear to be on an original stand with the often missing belt guard. $100 is a great price if it’s still available – don’t let OWWM Rule #5 bite you. As the others have said, $100 seams like a good price as long as there are no major issues. It will require quite a bit of elbow grease to get cleaned up. If you enjoy that sort of thing then go for it, if not you may want to keep searching but you are going to pay more for a decent 6 inch, especially the longer bed versions. I got my 37-220 for $175 but it was in a lot better condition, still needed a bit of TLC though. I’ve seen the same model go for $250 or more in “ready to use” condition. I’ve got one and it does a great job for me. Mine originally had a not so good wooden stand, but that was easily corrected. I’d agree with Planeman40 about setting the knives. Some newer machines have better ways to change and adjust knives, but it’s something you can deal with if you are patient. I don’t remember what I paid for mine, but $100 sounds like a good deal. Seems like a majority of used jointers are 4”. 10-4 on Rule #5, I have already arranged to pick the jointer up tomorrow, just couldn’t pass it up for that price. Im Looking forward to my first jointer and getting this vintage machine cleaned up. I’ll post some more pictures once I get her home. Thanks all for your valuable info. UPDATE: I picked up the Jointer today as well as a pretty awesome 56” sawmill blade. But back to the jointer. She is in desperate need of some love, missing two hand-wheels, a rear hand knob, and knife guard. None of which are readily available. I checked eBay and found one of the hand-wheels and the hand knob. I am still looking for the knife guard and another hand-wheel. If anyone knows where to acquire one it would be much appreciated. Below are the part numbers. After dusting her off, and doing a basic safety check, I plugged her in and sure enough she ran. To me (first jointer) the knives looked pretty decent. I took quite a few pictures and 2 videos of her running. Being the age of the machine, potentially replacing the belt, and bearings, seems like a good idea. Anyone familiar with a replacement belt for this model? Being pretty new with jointers, and older machines in general which bearing specifically would benefit from replacing? Thank you all for your input and knowledge. I took the belt/pulley cover off and the right side of the belt seemed flap as opposed to the left side which ran flat, there was also a loud vibration as the jointer was powered off. SEE VIDEO for better description. Overall I think I did ok, a quick dusting with a wire brush and the rust came off fairly easily. I’m looking forward to getting the jointer in precise working order, having the front and rear hand-wheels to adjust the indeed/outfeed tables would make it easier. Well I cannot for the life of me figure out how to post photos directly in post, tried several hosting sites the last one FLIKR. I keep getting the ? box in the preview. So Im going to post a link to the photo album hope you everyone is able to see the album. The belt may or may not be a stock item, as those shipped with and without motors or stands, so there are a lot of variations. If you can’t find a number on the belt, just measure it. As for bearings, I’d replace them all (cutter head and motor) and be done with it. You have no idea how much use/abuse that machine has seen or when (if) they were last replaced. Cheap and easy insurance and you will know they are good. You can find parts over at the OWWM site in the BOYD (Bring Out Your Dead) buy/sell/trade section. Those are pretty common jointers and were made for a long time, so there are plenty of parts available. Get your knives sharpened and order a spare set to have on hand while the others are out being sharpened. Thanks Brad, I will check out the BOYD, didn’t know about that section. Much appreciated! To post photos from your devise direct use the img tab. That’s what works for me,nice score on the jointer look at the size of that cutter head.. For a small jointer that should produce a very acceptable cut. I can understand the blade guard being missing as it lifts off, but the hand wheels? Curious. As to the “whistling” noise, try to locate it by taking the belt off and running the motor only. This should locate the noise. 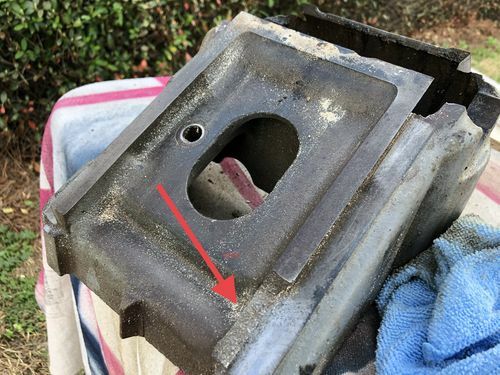 If the jointer hasn’t run in a long time, the grease in one of the ball bearings could have become stiff. Let it run for a while and see if it clears up. Also, if you paint the jointer, take one of the painted parts to the paint store. They can scan it for color and mix an exact copy of the paint color. Use an oil base enamel as it dries hard and is tough as a finish. Just brush it on. Sitting for so long probably put a set to the belt causing the vibration. I’d change it first and go ahead and do the bearings and you’ll be good for a long time! Make sure the beds are co-planer and the knives are sharp and set correctly and you’ll have a nice user once you clean it up and find some hand wheels. cabmaker is right about the fence being seriously beefy! So I’m elbow deep in restoring the jointer and after removing the tables. 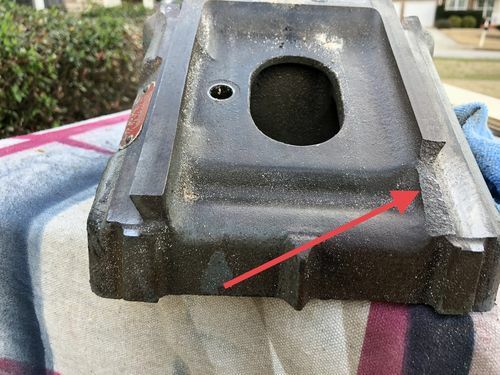 I found a broken casting on the rear lower dovetail of the infeed table. IS THIS GAME OVER? Is there a way to repair or work with it broken. I can see this being an issue with getting the tables co-planer. Should I scrap it and part it out? Thoughts. I’ve already got about $200 in it total.